I was wondering if I would have anything worth posting here today, then a friend came to visit and hey ho I have an excuse to cook!!! So lunch it was but to my disgust we had not a single piece of bread in the house, the kids polished off last nights leftover baps for breakfast so I had to think on my feet. The solution came from my 3 year old who was home sick today and asked for pancakes! So pancakes it was as I had everything available for that! One of the reasons I am so flipping overweight is because of my penchant for whipping these up far too often. Between that and eggs benedict (another story, another post!!!) I have steadfastly retained my larger waistline! The problem is they are soooooo quick and easy to make and are soooooo fab drowning in maple syrup and accompanied by a latte that I cave in far too easily!!! I feel like I am confessing my sins- forgive me for it has been over 1 month since I made them! The reason I make them so often is of course Nigella’s fault. Since acquiring Nigella Bites: From Family Meals to Elegant Dinners, Easy, Delectable Recipes for Any Occasion I have officially thrashed her recipe “American pancakes with wafer bacon and maple syrup”. It appears quite a few other bloggers have too, as when I did a search on the internet to try and lift the recipe (cutting and pasting makes life so much easier!) there was many a web column inch devoted to these wonders. Alas no-one had written out the recipe so I will be very kind and laboriously type it up to share it here!!! I think the reason I love this recipe is because it can be done in the food processor. It comes out so lovely and smooth and is almost instant! Just bung it all in, get the fry pan heated and away you go. I have even perfected this recipe to take camping using powdered milk!!!! No need to eat crap food even when you are roughing it I say! I am off bacon at the moment because of the attempt to eat additive free food (but did cave the other day when I spied some organic stuff that at least is SPCA approved and had much fewer additives, including no MSG!) so I decided to add in some raspberries. I nearly always have frozen blueberries in the house as that would be my preference but raspberries come a close second, and today they were first given they were in the freezer!!!! From time to time if I have spare egg whites floating around in my fridge (from making eggs benedict!!!) 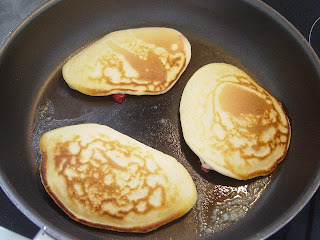 I will whip them up with a teensy bit of salt to the soft peak stage and fold them in for a fluffier pancake. Its nice for change! I have just looked at the recipe again and realised that surprise surprise I have mucked around with it!!!! So here is my ‘mucked around with’ version of Nigellas recipe. This makes 12 decent sized pancakes. Put flour, sugar, salt, eggs and milk in food processor and blitz til smooth. 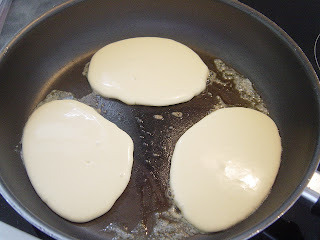 Heat pan, pop a bit of butter in to melt and start frying the pancakes- I use a 1/3 c measure to pour into pan. 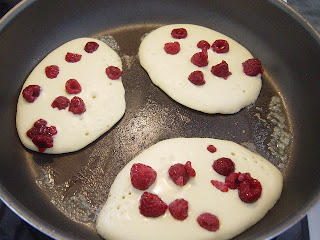 When bubbles start to show I sprinkle on the fruit I am using, if using frozen berries make sure they are thawed first, then turn over and cook for a couple of mins on the other side. 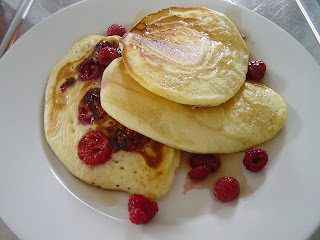 Nigella says the first pancake is almost always botched but I find that has never happened using a non stick frypan! Serve with bacon and lashings of maple syrup!!!! So after this transgression I vowed to have something virtuous for dinner, we had a twist on Nicoise Salad, the twist being no tomato as we didn't have any !!!!!! 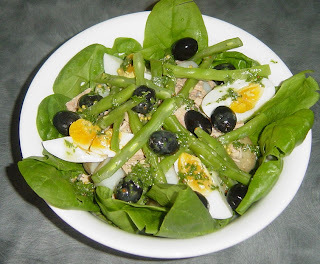 I love the lemony dressing for this, it has to be one of my favourite spring summer salads, with green beans and new potatoes and lots of fresh herbs in the dressing. Getting late so will post the recipe I use tomorrow, for now the photo will have to do!